Hamilton introduced a number of watches in the last two years of the 1960's. In fact, you could say the 1960's went out with a bang with well over 180 models in the line-up. That means that 16% of all the watch models ever offered were still for sale in 1969. One of the new models introduced in 1968 was the Sea Crest III. 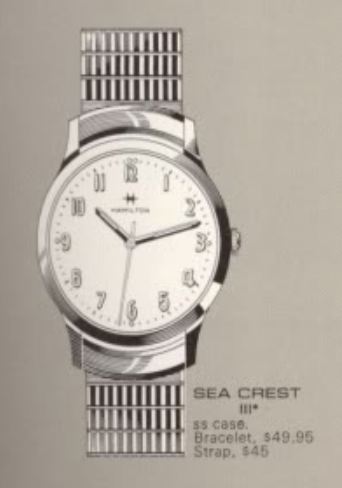 As you would suspect there was a Sea Crest and a Sea Crest II, the latter being discontinued after 1964. So the lineup was Sea Crest-free for a couple of years before the III was offered. The Sea Crest III is a fairly blah, conservative-looking watch with classic 1960's styling. It came in a one-piece stainless steel case with your choice of a strap or a stainless steel Kreisler bracelet. The dial has luminous dots and thin luminous baton hands to match. Tucked inside the case is a 17 jewel 688 movement. This grade is basically a manual-winding version of the ETA automatics used during the same period. I recently received a Sea Crest project watch in need of some TLC. It looked a lot better than it ran. As you can see, the timer shows a whole lot of something going on. It's running almost 10 minutes fast per day. Something is definitely not right inside. Being a one-piece case, the Sea Crest III opens through the crystal. With the crystal out of the way you can see the dial is actually textured with vertical lines. The watch is running, which is good, and the movement looks clean but even a trip past the demagnetizer doesn't have an effect on the performance. I can tell by the position of the regulator (at full slow) and the placement of the hairspring stud, that something is wonky with this balance. Everything gets fully taken apart and thoroughly cleaned. Any oil on the hairspring can make the watch run fast and if that was the situation here, it would be cleaned off now. The movement is nice and shiny and ticking away. One thing I noticed is the crown wheel screw is stripped, or the barrel bridge is stripped... one or the other. So it doesn't hold very well. The crown wheel is the smaller of the two winding wheels and closest too the stem at 3:00. I moved the hairspring stud counter clockwise a little to be closer to in beat. Now I can see what the timer thinks. Well, it's not running fast anymore... now it's running slow and the beat error is still maxed out. Time to take a close look at the hairspring. The hairspring has a nice coil all the way to the last turn, where it bends to go out and into the hairspring stud. I suspect the shape of this last section is incorrect. The last cm or so of the spring is also bent so the coil isn't flat when it's installed. This little section needs to be reshaped. I suspect someone's screwdriver slipped and went into the balance - bending the hairspring in the process. To fix it is really a test of one's fine motor skills. You need to take the hairspring off the balance, install just the spring in the regulator, and then observe where the center of the spring falls relative to the balance jewels. Ideally they would line up but if they didn't, you'd have to shape the spring such that the center of the spring is moved into the proper position. If you'd like to see such a process first hand, check out this video by the very talented Mark Lovick. I happen to have a donor 694A movement with a good balance so I will just swap the balance and see if that does the trick. As you can see, this balance is much better and with a few tweaks to the regulator you can see the beat error gets reduced to almost zero as the two lines come together. I still have to so something about the loose crown wheel screw but the watch is reassembled in the meantime. This watch has it's original bracelet as well. It's a nice looking example of a relatively uncommon model.